Whether you are celebrating your first wedding anniversary, Silver Wedding Anniversary (25 years), or your Golden Wedding Anniversary (50 years), don't let that important day slip by this year without sending an anniversary gift showing your love and consideration. Want to personalize your anniversary flower arrangement? Teleflora allows you to send any number of red roses in your anniversary bouquet to match the number of years you are celebrating, so you can send 7, 13, 15 or even 50 roses in your bouquet to convey a message that's yours and yours alone. Romantics can celebrate any special date, not just a marriage; maybe you send 9 roses if your anniversary is in September, the ninth month of the year, or maybe your first date was at a restaurant on 9th Avenue. They say that 13 roses means that you have a secret admirer, but maybe it just happens to be the day of the month you first met. To order visit our order Roses By the Stem™ page. And remember many of our "Flowers in a Gift" anniversary floral arrangements - feature our exclusive keepsake vases - like two anniversary gifts in one! 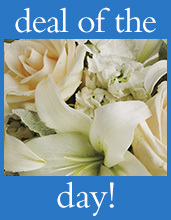 Why order your Anniversary flower arrangements from Teleflora?